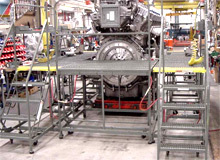 Assembly Floor Work Platforms - EGA Products, Inc.
A First Tier Supplier to an internationally renowned manufacturer of industrial engines commissioned EGA to design and build a customized Assembly Floor Work Platform that could surround engines under assembly. The engines are over eight feet tall and 12 feet long, thus requiring elevated access. 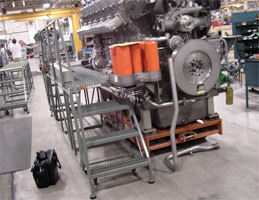 EGA engineers designed a platform that closely accommodates protrusions in the overall shape of the engine, thus maximizing worker access and proximity to it. 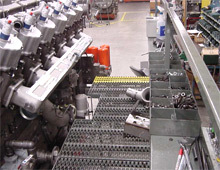 The platform can also be easily moved from engine to engine under assembly without having to be dismantled. Platforms are quickly and easily secured together to ensure continuity of platform sections. Heavy duty construction accommodates over 1000 pounds, making the platform stable for multiple workers. 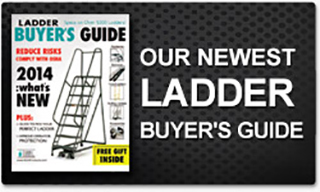 As well, the multi-sectional configuration with dual ladders allows for easy ingress, egress, and movement on the platform. Rely on EGA precision engineering and manufacturing expertise to design and build custom assembly floor work platforms like these, and other equipment that will meet the specific people-access, materials-handling, or storage needs of your industry and its processes—no matter how simple or complex your requirements.